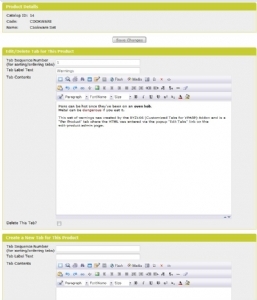 This allows you to easily add your own product tabs to your product detail pages. Compatible with VPCart V7 to V8. Warning and Info Tabs The "warnings" tab on the example page has been created via BYZ166 per-product tabs, and the "Info" tab on the example page has been created via BYZ166 as a "functional" tab; the tabs only appears for products that have relevant data in it. Perhaps you want to display a tab to show a link to a specifications url, but you only want to show your "Specs" tab when you've got the url in your products table. Or, maybe you want to display a text chunk as an extra tab, but only if that text chunk isn't blank. Or, maybe you want to display more complex stuff using lots of product columns, but only display the tab in specific instances depending on the product in question. This addon allows you to configure "dynamic" tabs that only show up when relevant, and you can show them in any order you want. This is used, for example, if a product is a food product, and you want to create a new tab for the product for "Ingredients", where you enter all the HTML for that ingredients tab via the popup "View/Edit Tabs" link on the Edit-Product page. When you're on the Edit-Product page in admin, press the "View/Edit Tabs" link (under the long-description field) to get the popup where you can create/edit your HTML-Based tabs. This popup allows you to create as many tabs as you want for a given product, where you specify the label for that tab, and its sequence/ordering number, and the HTML for its contents. When you create/edit/delete tabs from this popup screen, there is no need to alter the byz_ptb_$config.asp file or to make any changes to the byz_ptb_extra_tabs_inc.asp file. This is the easiest way of creating new tabs on a per-product basis, as you simply need to add the label and enter the HTML in the popup screen for when you want to show a given chunk of HTML as a new tab on a given product. Per Product tabs are compatible with multiple languages, ie you can have different tab labels/content for different languages on a given product. This is used, for example, if you already have relevant information in your data and you just want to display that information in a tab when relevant for a given product. For example, you already hold the supplierid in your products record, and you want to display some details about the relevant supplier in a "Supplier" tab for your customers, but you only want that tab to appear when the product you're viewing has a supplierid stamped on it. Another example would be if you're selling DVDs and you only want to stamp the rating on your products records (eg you want to put "18" or "15" etc in pother5) and you want to create a "Rating" tab which shows a standard block of HTML depending on the rating, without having to manually create the tab data via option 1.
i.e. 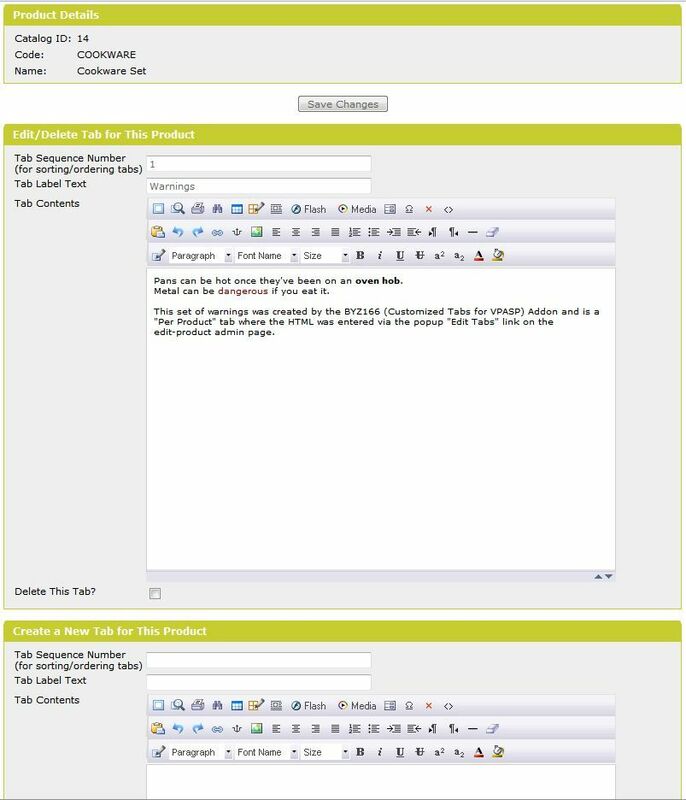 This is not entered from the View/Edit Tabs screen like option 1, instead this is a more complex function-based tab, which looks at the product data of the product in question, works out what the HTML contents of the tab should be, and then outputs the tab if relevant to that product. If you want to use this "functional" type of customized-tab, then read the usage file which explain how you can create them. If you don't want to use this "functional" type of customized-tab, and you just want to create HTML-Based tabs on a per-product basis, then you can simply use option 1 mentioned above. All the processing to show the relevant tabs in the relevant instances is done for you behind the scenes at browse-time by this module's tab functions. We've provided several examples, and loads of notes/comments in the files to explain how to setup tabs using this module. The addon includes simple, easy to follow installation notes, as well as more detailed "usage" notes to explain how to create customized tabs, with loads of examples. 02 12-NOV-2010 Created a new popup in admin where you can add tabs and their corresponding labels and HTML on a per-product basis, this has its own dedicated table which is created as part of the installation process. 03 15-NOV-2010 Fixed a bug where it wasnt saving the html-descriptions on the view/edit tabs popup. Added extra logic so that if the html-block is blank for a tab created via the view/edit tabs popup, then the tab is not shown on the product page. 04 30-MAR-2011 Enhanced to cater for multiple languages for the per-product tab data. Upgraded BYZ038 (from V12 to V13). Please Note: If upgrading from V02 or V03, please upload the byz166_addlangcol.asp file to your main (customer-side) vpasp folder before you upgrade the webfiles, and open/run it, and then delete the byz166_addlangcol.asp file from your site, but dont run/upload the byz166_prepare.asp file. If upgrading from V01 then upload and run byz166_prepare.asp and then delete byz166_prepare.asp from your site. If upgrading from V01, V02, or V03, make sure you install BYZ025 (V06 or later) before upgrading BYZ166. Brought up to date with latest vpasp V7 tab logic/styles (eg to fix some elements that were drawing a spurious extra box or not working properly with internet explorer etc). Corrected and tidied-up html on admin screen. Changed to use the new BYZ038 functions where appropriate (including cursors which should now use less memory and be faster). Please Note: You must be using V19 or later of BYZ038 before upgrading to V05 or later of BYZ166. BYZ166 V05 or later will not work with V18 or below of BYZ038. Please Note: You must be using V08 or later of BYZ025 before upgrading to V05 or later of BYZ166. BYZ166 V05 or later will not work with V07 or below of BYZ025. Please Note: If upgrading from a previous version of BYZ166 you will need to make sure you add the include of the byz_ptb_global_fun_inc.asp file to your byz_sys_global_fun_inc.asp file, see the installation notes for more details. Changed to use more BYZ038 library functions where appropriate/possible. Added extra installation steps to allow deletion and copying of product tabs data from the edit-product screen when you delete/copy a product record. Please Note: If upgrading from V01, V02, or V03, then please upload the admin/byz166_prepare.asp file to your VPCart admin folder, login to admin, and then run/browse the byz166_prepare.asp file following the notes on the screen, and then delete that file from your admin folder. Please Note: If upgrading from V01, V02, V03, or V04, then you will need to make sure you add the include of the byz_ptb_global_fun_inc.asp file to your byz_sys_global_fun_inc.asp file, see the installation notes for more details.